Guys, it’s spring and you know what that means… time for everyone to start doubting their life decisions and start making huge changes. This can manifest itself in a plethora of ways. Maybe you decided to get a pixie cut, or maybe you finally decided to get the dog you’ve been eyeing. I decided I was going to stop lying to myself and change my major. This may not sound like a big deal, but to me, it really was. I had dedicated two years of my college experience to becoming a pharmacist and for me to just throw that out the window seemed foolish, even in my mind. Picture me sitting at dinner with my friends, and then having a sort of “That’s So Raven” esque vision of the rest of my life, and blurting out, “I think I need to change my major.” The table was silent, which is never a great reaction. We talked about it for a little bit and then dropped the subject like it had never been brought up in the first place. But I didn’t forget about it — in fact, the opposite happened. The possibility took over my mind. It’s like the thought had moved into my head and plopped on the couch and was just waiting for me to kick it out. But I’m too nice for that. Me: I don’t love pharmacy, I don’t love medicine, I don’t feel like I fit in this major and I want to do something that pharmacy is not going to be able to offer me long-term. The thought in my head: So what’s stopping you? Nothing. Nothing really was. I’m fortunate to have parents who support what I want to do, and at the end of the day, it is my decision, not anyone else’s. I had kept my doubts to myself for a long time, because usually when you mention you are even thinking about changing your major they respond with “Are you sure?” At a moment like that, the last thing that I wanted was more uncertainty. I really just wanted to be asked, “Why?” so I could attempt to explain the labyrinth inside my head and maybe make sense of it myself. 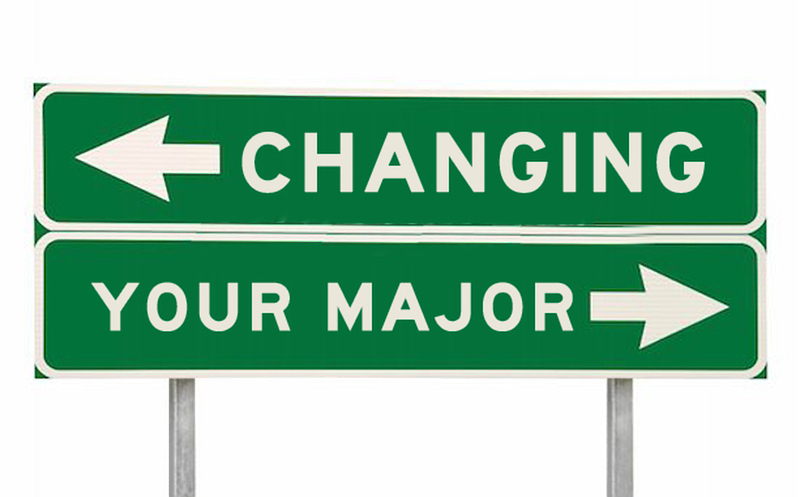 I think fear is probably the number one reason that people don’t change their major, even though they may want to. Maybe it’s fear of what their friends and family might think, fear for their future, or maybe fear that they might have to change it yet again. But at the end of the day, you have four years and, really, the rest of your life to figure out what you want to do. You just have to be walking in the right direction. After my breakdown, maybe more of a break through, I emailed both of my advisors and one of my professors, whose opinions I really value, to set up times to dissect my life. During these meetings, I was nervous about opening up and acknowledging that I was lost, but when I walked out of them, I was even more solidified in my decision. Finally signing the paper to switch my pharmacy major to a chemistry major was one of the most exciting things I’ve done in college so far. I’m relieved and ready for the new opportunities that are ahead of me. Change isn’t a bad thing; it’s just different thing. Part of me believed to some extent that I’d failed, but my major has nothing to do with my self worth, and if anything, I won. This doesn’t mean that I have it all figured out — because who the heck does — but I’m one stepping stone closer to making my life exactly what I want it to be. If you’re considering changing your major, I would encourage you to explore it. If you’re having doubts, they’re there for a reason, so ask yourself, “Why do I want to do this?” because it might be the biggest favor that you do for your future self.